By The Sea festival returns bigger and better than ever before for its 2017 edition, which runs from Friday 29th September – Sunday 1st October at Dreamland, Margate. 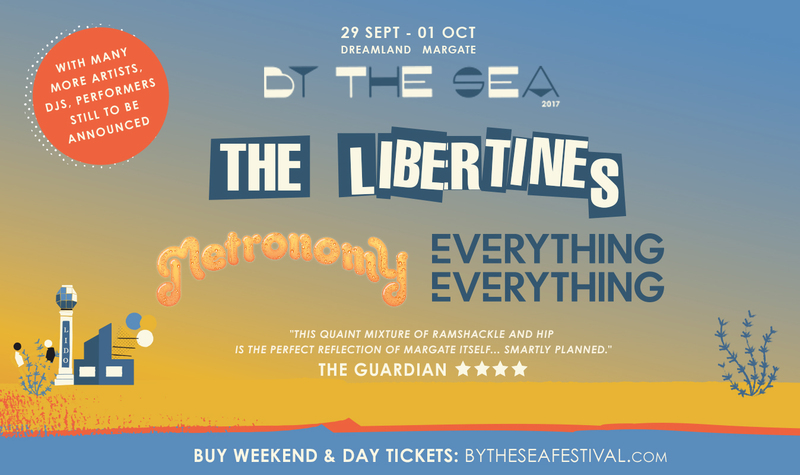 Now expanded to a third day for the first time in its history, By The Sea can announce that its headliners for 2017 will be The Libertines, Metronomy and Everything Everything. Headlining on the Friday night is Everything Everything. Over the course of three albums, the quartet have risen from a cult underground favourite to become one of the nation’s biggest and most uncompromising bands. Along the way they’ve been nominated for three Ivor Novellos and the Mercury Prize, and their most recent albums ‘Arc’ (2013) and ‘Get To Heaven’ (2015) have both hit the Top 10. The band are continuing work on new material with James Ford of Simian Mobile Disco and are about to embark upon a sold-out tour. Metronomy’s latest album ‘Summer 08’ found multi-instrumentalist Joe Mount reflecting on his experiences around the time that Metronomy first landed a major breakthrough with the ‘Nights Out’ album – the guilt at spending key moments in loved ones' lives in the back of a tour bus, and the confused mania of finding himself a critical darling. With a string of rare yet consistently sold-out shows under their belt since the album release; By The Sea will present Metronomy with a chance to play to an intimate crowd in a particularly striking environment on Saturday 30th September. Mount has been working on material with the new and currently unreleased track ‘Lately’ becoming a staple of live shows. Bringing By The Sea to a close on Sunday night will be The Libertines. With a discography full of iconic anthems and the compelling connection between frontmen Carl Barât and Peter Doherty, The Libertines need no introduction. Classics such as ‘Time For Heroes’, ‘Don’t Look Back Into The Sun’, ‘Up The Bracket’ and ‘Can’t Stand Me Now’ are perfect festival material. Pitchfork once stated “A third Libertines album once seemed about as likely as a fifth Smiths LP”, but the release of their 2015 album ‘Anthems For Doomed Youth’ proved to be an irresistible return to action. A full supporting cast of artists and DJs will be announced shortly.